When thanking someone, individuals may not fully appreciate the positive feelings that their expression of gratitude engenders. And that may explain why some people don’t show their appreciation more often, a recent study published in Psychological Science suggests. “People don’t seem to walk around in their day-to-day lives giving thanks to people all that often,” says Amit Kumar, who conducted the study as a Postdoctoral Research Fellow at the University of Chicago. Kumar and his co-author, APS Fellow Nicholas Epley, a Professor of Behavioral Science at the University of Chicago, explain that decisions are guided by the expected value of an action, so underestimating the positive effect of gratitude might lead to less expression in day to day life. “I think this research adds to our understanding of people’s daily lives and speaks to simple ways in which they can be improved,” says Kumar, now an assistant professor at the University of Texas at Austin. The authors suggest some reasons that individuals might undervalue gratitude. First, expressers might assume that a recipient already knows they’re appreciative, so they underestimate the recipient’s surprise at being genuinely thanked. Second, actors tend to evaluate themselves in terms of competence, so they may worry about how they express gratitude. Yet observers tend to evaluate people based on warmth and intent, so expresser could underestimate how happy, and overestimate how awkward, they’ll make the recipients feel. Previous research demonstrates that when put in a prosocial situation, such talking to a stranger on the train, individuals report increased positive effects, even when they predicted a negative experience. Kumar and Epley used a similar prediction component to observe the disparities between expresser expectation and recipient reaction. In four experiments, participants identified someone they felt had a positive impact on them and predicted the recipient’s reaction to receiving a letter of gratitude. The researchers then surveyed the recipients of the letters and compared their actual feelings to the expressers’ expectations. In the first experiment, students in a business class wrote letters of thanks to peers, explaining how the person had affected their life. Participants reported on their own feelings about sending the letter, and predicted to what extent the recipient would feel happy, awkward, and surprised after receiving and reading it. The researchers then distributed surveys to the recipients asking them to report on the same measures. Although expressers predicted that the recipients would feel positively about the letter, recipients reported even more surprise and delight than what the senders expected. Moreover, expressers overestimated the awkwardness that the recipient would feel. The second experiment followed a similar procedure, but the expressers could write to anyone they chose. As in Experiment 1, the expressers underestimated the recipients’ happiness over the letter, while overestimating awkward feelings. The expressers in this experiment didn’t underestimate recipient surprise with receiving the letter, but they did underestimate the surprise that the letter’s contents would produce. The next two experiments considered an individual’s likelihood of expressing gratitude. Participants thought of multiple people toward whom they felt grateful, predicted each recipient’s response to receiving a letter on the same measures, and ranked their likelihood of actually sending a letter to each person. In these experiments, an expresser was more likely to write a letter to someone they predicted would react positively, and less likely to write a letter to anyone whom they expected to feel the most awkward. 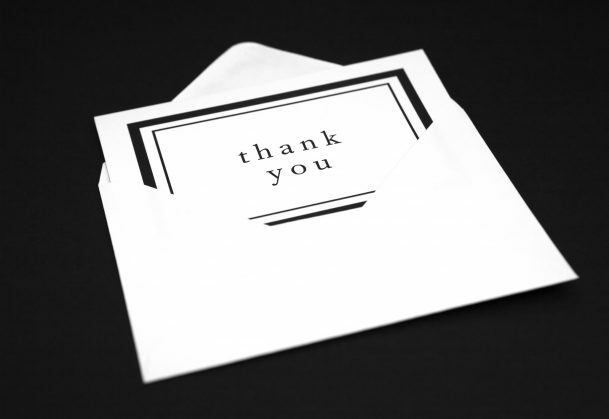 To what extent were you able to express your gratitude using words that were just right? After your recipient reads your letter, how articulate do you believe they will think your expression of gratitude is? After your recipient reads your letter, how warm do you think they will perceive your letter to be? How sincere do you believe they will think your expression of gratitude is? The results of a follow-up survey showed that expressers underestimated how competent and warm the recipient would rate them. They particularly underestimated their competence ratings, indicating that this might be the biggest barrier for expressing gratitude. This study paves the way for future gratitude research, especially on the relationship between expected value and the mode of expression. For example, expectations of recipient awkwardness might influence an expresser to show gratitude over social media instead of in person. The study’s findings have implications for research on other prosocial behaviors, which studies have shown improves subjective well-being. Thank you for your work. As we experience a general blanket of negativity today, the work on gratitude I believe will transform many thus impacting a culture of change toward love, service and kindness. I love the section about the gratitude toward the stranger on the train. Life really is that train ride where people come and go. Some will ride alongside briefly, others much longer. Gratitude makes the journey worthwhile.